It can be both an honour and a curse. Being asked to be a bridesmaid by your overly-enthusiastic sister/ best friend/ acquaintance/ relative can incite feelings of love and excitement, but can also create equal measures of dread and loathing. What if the bride- who is usually mild-mannered and sweet- turns into a vicious bridezilla beast overnight and demands the world from you? What if an already slightly difficult bride turns even more high maintenance as a result of her increasing stress levels, and decides to take it out on her new ‘slaves’? It’s a role that can either cement or destroy relationships, and it’s only until it happens to you that you know what the outcome will be. Film comedies like Bridesmaids, 27 Dresses and Bride Wars add further credence to this well-known bridal party conundrum, and while it’s true that not every bride becomes a beast as her wedding day approaches, there is a distinct possibility, as evidenced by the above stereotypes. 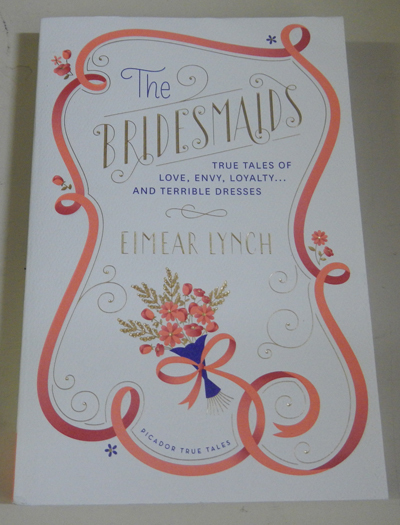 Eimear Lynch, a journalist and editor for numerous magazines, decided to speak to dozens of women (and men) who have experienced the rite of passage of being a bridesmaid, and hear the stories from their own perspectives. From hideous dresses and wild bachelorette parties, to unique relationship woes and sometimes scandalous hijinks, nothing is left untouched in this collection of tales. There are over 50 stories told in this book, and the narrators come from all walks of life- from wedding aisle veterans to first-time maids, from ex-nuns to butch lesbians, from heterosexual brothers to fashion models, and from religious fanatics to redneck hillbillies- it seems that everybody can have the honour of standing alongside the bride as their confidant and helper on the big day. While many of the stories have a happy ending, there are just as many that don’t, and readers get a unique look at some of the action that goes on behind the scenes (including some of the crazy antics that are involved in the production of such a huge and important event). But it’s not just the actual weddings that are documented- the lead up is just as important, as readers will learn- and the overall success of the ceremony appears to be very dependent on the planning, parties and help of the bridesmaids as the day approaches. Hurricane warnings, destination hens’ nights, too-tight dresses, and imposing mothers be damned, if none of these things go according to plan, it’s the bridesmaids’ heads on the chopping block (as well as the source of a very interesting tale to tell). At the time of writing, I have only been a bridesmaid twice (for two of my best friends), and I was lucky enough to have great experiences in both weddings. As you read the stories that Lynch has collected, you can’t help but compare your own experiences to those featured in the book, and it’s likely (as you drift through the stories) that you’ll either be commiserating or feeling a great sense of relief about your own involvement in the weddings you have attended. This book would make a great gift for any bridesmaid-to-be.